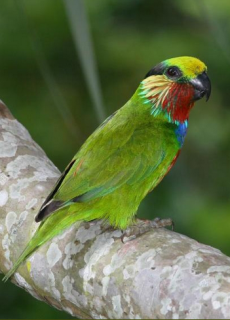 The Fig Parrot family needs vitamin K supplements to stay healthy, more than other families of parrots. Male-yellow/green forehead and crown; olive/brown occiput merging into wide black band across nape of neck to eyes; red cheeks and throat; yellow ear coverts, with thin and elongated feathers variously mixed in and tipped with red and blue; blue/black band across upper breast; red central underparts from lower breast to upper abdomen; orange/red edged inner wing coverts; wide cream/yellow underwing stripes. Bill grey/black. Eye red. Female-as in male, but with wider breast band coloured dark blue; yellow/green lower breast to upper abdomen. As in adult adult female but with yellow cheeks with variable red markings. Eye red/brown. Calls made in flight are somewhat screechy; also emits sounds like coins dropping on concrete. Some notes staccato and abrupt. Parrots: Their Care and Aviculture, Low, 1986. Walk-in enclosure minimum length 2.1m (7 ft) or indoor aviary minimum length 1.8m (6 ft). Dried figs soaked in water for a few hours, two or more per bird daily with a drop of vitamin K additive; fruits such as: apple, pear, orange, banana, cactus fruits, pomegranate, forming at least 50 percent of the diet; soaked sultanas; berries (elder, mountain ash, pyracantha); spray millet; small seed mix such as: canary, oats, safflower and a little hemp; cooked pulses and beans; rearing food made from: hard-boiled egg, wholegrain bread and carrot all ground to crumbly consistency. Breeding diet: mealworms; commercial insectivorous food. Withhold seed for first three weeks of chick's lives. Vigorous chewers, so provide flowering, fir, pine and willow branches; wooden toys, vegetable tanned leather toys, heat sterilized pine cones. L-shaped box with base 5" x 10" (12.7cm x 25.4cm), height 5" (12.7cm). NE New Guinea, from Humboldt Bay, Irian Jaya, east to Huon Gulf, Papua New Guinea. Found up to 800m (2624 ft) in humid lowland forest, partially cleared areas, forest edge as well as near human settlements. Feeds on fruits, figs, casuarinas, nectar and possibly insects. Are usually found in pairs or noisy groups. Flocks of up to 400 birds have been recorded in the tops of fruiting trees. Birds are quick moving, hanging upside down to reach food.